The outside speaker policy at Chicago’s DePaul University vests a single DePaul administrator with broad powers to reject any campus speaker based on the content of his or her speech. 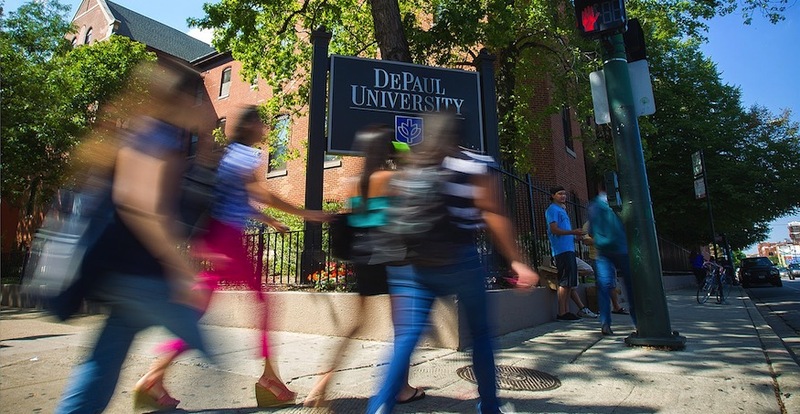 The policy runs afoul of the free speech promises DePaul makes to its students and faculty. Concerns over DePaul’s Student Organization Speaker Review Procedures again came to light last month, when the university rejected a request by the DePaul chapter of Turning Point USA to host an event featuring TPUSA founder Charlie Kirk and the group’s communications director Candace Owens on campus on Oct. 16. DePaul told Newsweek that the event was cancelled because TPUSA failed to follow its established marketing and ticketing guidelines for student events. It’s true that DePaul’s policy requires that student organizations “may not begin publicizing” their intent “to bring a particular speaker to campus until a final decision has been made” by the Speaker Review Committee, and organizations are “strongly encouraged to request that the speaker also not publicize the potential invitation.” It’s also true that the Kirk and Owens appearance was publicized before a decision had been made. DePaul arguably could have rested its decision not to move forward on that basis and left it at that. Instead, DePaul cited the speakers’ prior expression as a contributing factor in its decision to bar the event. “A major contributing factor in the request denial was the marketing and ticketing of a proposed event prior to approval,” Associate Vice President for Student Affairs Rico Tyler wrote in a Sept. 17 denial letter to DePaul’s TPUSA chapter. But “concerns regarding violent language at the sponsoring organizations [sic] national convention as well as identified populations being singled out in a demeaning fashion were discussed” and counted among the “considerations” leading to the denial. The university has not disclosed the specific “violent language” that was considered and ruled sufficient to disqualify students from inviting Kirk and Owens. In a series of tweets, Owens contested DePaul’s characterization of her words as violent. For the first time ever, my right to speak as a black conservative is being DENIED at @DePaulU in Chicago by VP Rico Tyler. He has referred to my words as “violent language”. BLACK PEOPLE DO NOT HAVE TO BE DEMOCRATS is not “violent language”. My ideas are not violent. In fact they are so sensible that they require censorship. Censorship—because they threaten the entire liberal establishment which has been built upon a lie. @DePaulU, there is no event you can cancel that will stop this political awakening. Owens’ event is now slated to happen on the original date, but at an off-campus location. DePaul is a private institution. It is not bound by the First Amendment. But it should keep the promises that it makes, including its promises that students enjoy freedom of expression at DePaul. Yet DePaul’s Speaker Review Policy undermines these promises by allowing the university to unilaterally disallow campus speakers whose views it finds distasteful. This presents little threat to speakers whose views are relatively uncontroversial, but permits DePaul unfettered discretion to bar any speaker whose past statements have been in any way controversial. And lest you think DePaul discriminates against only conservative-leaning speech, think again: The university has a long history of burdening speakers whose views extend far across the political spectrum, including campus socialists and student advocates for drug reform. The TPUSA incident demonstrates how DePaul’s speaker policy also goes to great lengths to appear to provide an impartial process, when in reality, it simply gives DePaul additional opportunities to ensure controversial speakers stay off campus. This strongly suggests DePaul’s policy is intended to be a means of allowing the administration to stop speakers under the guise of subjecting them to a majority vote, and giving them an override in case that stopgap fails. Since DePaul promises students the right to free speech, students shouldn’t have to appeal a viewpoint-discriminatory decision about a speaker they want to invite. DePaul should be upholding its commitment to freedom of expression, not panels’ decisions to the contrary. The university should also be open about its speech-related processes. DePaul has a downright dismal record of providing the free speech rights it promises students — so much so that when FIRE named its 2018 Worst Colleges for Free Speech earlier this year, DePaul received FIRE’s first-ever “Lifetime Censorship Award” for having either appeared on or been considered for our Worst Colleges so frequently we felt it warranted a special (dis)honor. With DePaul’s consistent disregard for the free speech rights of its students, including policies like the one implicated in this latest campus speaker debacle, the university appears poised to live down to its ignominious title for a long time to come.